Polished shoes look great and last longer. But you don't need to lay out your hard-earned cash for expensive, store-bought shoe polish. Make your own: It's inexpensive, chemical free, environmentally friendly, and all natural. 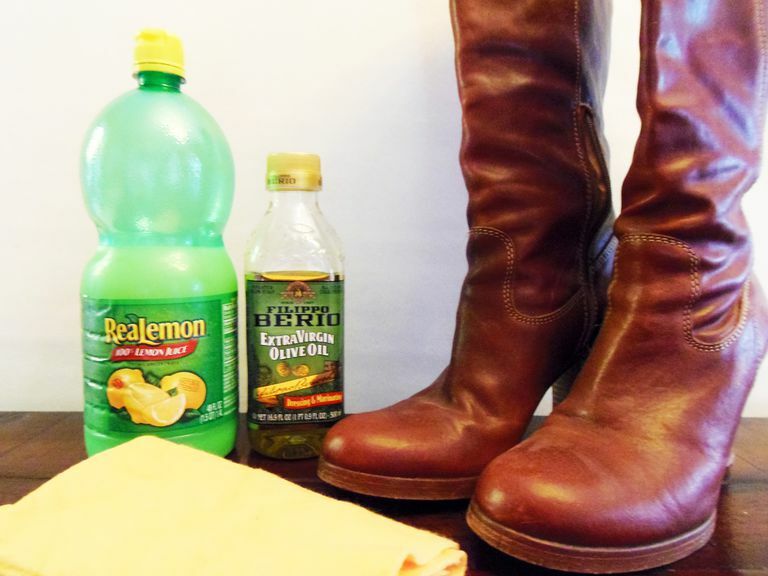 Read on to learn how to make a top-rated shoe polish from things that you already have at home. You really don't need a lot of supplies to make homemade shoe polish. You probably have the ingredients at home right in your kitchen pantry. 1. Combine one part lemon juice with two parts olive oil to form a polish. 2. Use a clean cloth to rub a small amount of the polish into your shoes, and allow it to soak in for a few minutes. 3. Buff with another cloth, and enjoy your shiny shoes. Apply the polish to clean, dry shoes. You definitely don't want to lock in dirt and stains by coating them with polish, so take the time to give your shoes a good cleaning first. Polish your leather shoes monthly, or as needed, to extend their life. This will keep the leather from splitting. Cheap olive oil works just as well as more expensive grades. This recipe is intended for leather—not suede. Applying oil to suede will result in stains. If you don't have olive oil or lemon juice, there are a couple of other ways you can create homemade shoe polish. A banana peel: Use the inside of a banana peel to shine your shoes. Just rub the peel over your leather shoes, and the oils in the peel will restore your shoes to their original polish. Toss the peel in your compost afterward, and you won't have any waste. Homemade shoe paste: If you polish your shoes often, make your own can of shoe paste to replace the store-bought version. Just melt equal parts , a solid oil (like cocoa butter), and a liquid oil (like olive oil) over a double boiler, and pour it into an empty container. Allow it to harden fully. The paste is ready to use. Just work it into your shoes, wipe off the excess, and you're good to go again. The oil will condition and polish your shoes, while the beeswax will add a coating to protect against water, salt, and any other grime you come into contact with. While you're busy sprucing up your shoes, it may be time to deodorize them, too. There are two easy ways to accomplish this. You can stick your shoes outside for a few hours, and let the sun work its sanitizing magic, or sprinkle baking soda inside them. Leave the baking soda in your shoes for a little while, come back after a few minutes, and shake it out. Using baking soda will also help . Additionally, try not to wear your shoes multiple days in a row if you can avoid it. Allowing your shoes time to breathe and dry out between uses will make them last a lot longer—and smell better.